TruVape have taken ‘vaping’ to the next innovative platform with a sophisticated product range of e-cigarettes and liquids. The brand launched their online product range in October 2013 and opened their first vaping studio and store in Greater Manchester in the same year. The local management team behind the brand have been hand selected due to their expertise in technical management, brand franchising and marketing, with senior managers based in the USA and China. E-Cigarettes have really taken off in the UK and the figures continue to grow, nearly 10% of UK smokers now use e-cigarettes, this is more than any other nicotine replacement. If the studies are to be believed, within 10 years there will be a complete reversal of the current tobacco vs e-cigarette industry figures. 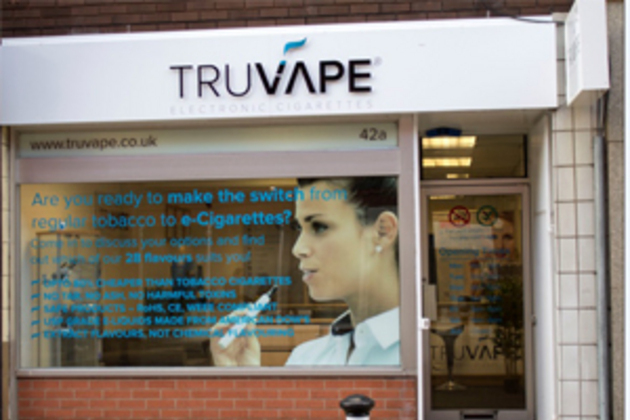 TruVape use electronic suppliers with full European certification and all liquids are made using medical grade nicotine, USA Pharmaceutical grade PG & VG and natural flavourings. "TruVape use sophisticated vaporising technology, manufacturing a more innovative product with changeable coils which are cost effective and aesthetically pleasing. 99% of brands are still producing CE4 and eGo batteries. The benefits in choosing a brand like TRUVAPE is the durability and battery life of the product. The ease of use when filling up with liquids is also a deciding factor. Today the industry standard is the 2-piece design. This design makes replacing the e-cigarette cartridge very easy, because the cartridge comes pre-filled with smoking liquid." E-cigarettes produce 8 to 450 times less carcinogens than regular cigarettes and contain much lower amounts of carcinogens than lit cigarettes. E-cigarettes are often regarded among the medical community as both a valuable harm reducing alternative to lit cigarettes and an effective smoking cessation aid. "TruVape​ boast an e-liquid portfolio over 20 different flavours, which allows customers to pick and choose a wider variety of tastes to suit their mood, occasion and select their favourite option. The Cartomizer Life is also a key factor in making sure you get a great flavor for longer. With an extensive product range of disposable to USB chargeable vapourisers, this brand offers a magnitude of choice that can fit into your daily lifestyle, making your vaping experience effortless, cost effective and enjoyable".